Search for Ann Hasseltine Judson in CBW. Find Ann Hasseltine Judson on the Pop Chart. She carried the light of civilization into the darkest corner of the world, it seemed. For those at home reading of the heroic service of Ann Hasseltine Judson, the first celebrated female American missionary, it was an ideal sacrifice: to leave home and venture into this darkness armed with true belief. The work of spreading Christianity exposed her to disease, starvation and bodily suffering before she died in Burma. In biographies written during the latter half of the nineteenth century, Mrs. Judson becomes a contemporary, realist saint, her martyrdom "magnanimous and sublime," her career a public distinction (Clement, 52). Her devotion to the noble cause of saving souls modeled a new way women could participate in heroic work outside of the home, though memorials often frame Ann's ministry as the helpmeet of her missionary husband, Adoniram Judson. George Hervey writes: "As the life of Mrs. Ann Hasseltine Judson was completely identified with that of her heroic husband, it has been thought neither desirable nor possible to contemplate them altogether apart" (277). Yet, in Burma, surrounded by strangers, Ann would face her most significant trials apart from her husband, bereft of his protection and in fact, protecting him. Commendable examples become most effective through such mirroring between the inspirational figure and the more common reader. As a young adolescent, Ann enjoyed the amusements and entertainments that most lively girls her age pursue. Her disposition was active and restless, such that her mother described it as "rambling" (qtd. in Knowles, 5). However, she also showed self-discipline when it was required of her, and applied herself assiduously to her studies at Bradford Academy. In her aptitude for learning and dedication to mental improvement, education was the first sphere in which Ann markedly stood out from her peers. Following a favorite method in collective biography of reading gleams of a heroine's future greatness in her developmental years, Frank Goodrich focuses on her determined approach to education: "Here [at Bradford Academy] she first displayed those qualities which so distinguished her in later life—strength of mind, precision of thought, and indefatigable perseverance" (343-4). Ann Hasseltine’s earnest self-improvement, in Goodrich’s account, implies that a reader similarly detemined might rise to eminence from the common level. A noteworthy detail in many accounts of the dissipated phase of Ann Hasseltine’s development ties her to another heroine celebrated in the annals of collected biography: Ann was said to have received the first conscious glimpse of the eternal peril in which she had placed her soul when she incidentally picked up Hannah More's Strictures on Female Education and her eyes providentially fell upon a quote from the Bible:"She that liveth in pleasure is dead while she liveth" (qtd. in Wyeth, 16). The repetition of this detail exposes the mechanics of the mirroring technique biographers use: Ann's introspection is sparked by something she reads, modeling the effect her own story is intended to have upon the reader of a collected biography. While this incident was not an instantaneous moment of conversion for Ann (she had several relapses into pleasure-seeking), it is significant for revealing the work being done behind the biography in terms of crafting patterns for other women to follow. So complete was the conversion that Ann herself becomes, in turn, "an influence of a high character" for the readers of her biography. Some biographies don't acknowledge her youthful folly—in these works, she was always already an infallible paragon, though at first waiting to discover the avenue for her heroic work. At age seventeen, this avenue was paved by religion: Ann "publicly professed herself a disciple of Christ" when she became a member of the Congregational Church in Bradford on September 14, 1806 (Goodrich, 345). The missionary impulse in Ann was stirred—in a short time, it would not be friends whom she engaged to seek Christ, but strange "heathens" (a term ubiquitously used during the imperialist era) in the distant land of Burma. The sacrifice laid bare in this letter shows the religious zeal felt by all parties—parents who would accept this fate for their daughter, a young woman who would knowingly subject herself to such trials a world away from the family and home of her childhood. However, there was also a conflict of interests apparent in the hasty engagement, which took place only three months after they first encountered each other at Mr. Hasseltine's dinner table. In her journal, Ann expressed concern that her attachment to Adoniram would sway her to become a missionary—a commitment that should be motivated by a calling to religious duty, not by feelings of personal affection. Public opinion at that time was opposed to such a calling for a woman: "It was deemed wild and romantic in the extreme, and altogether inconsistent with prudence and delicacy" (Wyeth, 31). Ann Judson recognized that she placed herself apart from prudent and delicate women—from any female peers—who might confine their work to charitable visiting in the parish. Ann's belief that God had directed her to this higher calling was labeled as a "delusion" (Wyeth, 35) by some—just as her religious zeal was derided as the "wild and romantic" (31) fantasy of an impressionable and enamored young woman. However, the reality she faced in Burma fully tested her faith: Ann would come home once for the sake of her health; yet, she returned to the mission with as much zeal as she had the first time, not then knowing the hardships that awaited her. Biographies written after her death and memorials that sought to revive missionary spirit laud her true courage and faith in a work that paved the way for women who felt called to a similar duty. These biographies also register the evolution in public opinion; by the end of the nineteenth century women's engagement in wider fields of public work had become far more acceptable. In Burma, she would learn a different language altogether. The four-month voyage at sea tested her endurance for a life that guaranteed hardships. 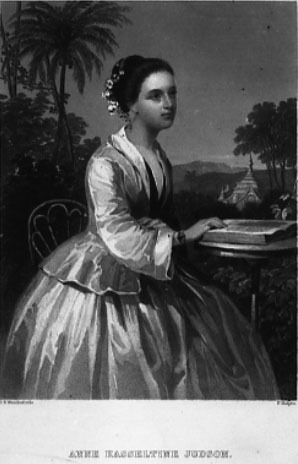 At least one other female did accompany Ann: Harriet Newell, wife of missionary Samuel Newell, though the party split ways upon arrival in India. Both left America together; however, Ann was the first to commit herself to the missionary work of spreading the Gospel amongst the native people. But her friend would be the first to die in the service of this Christian calling, succumbing to illness, along with her newborn child, only a few months after arriving on land. In the pattern of modeling that collected biographers reproduce, several writers held Harriet up as "the proto-martyr of American missions" (Goodrich, 350; Wyeth, 4). Worth noting is Goodrich's emphasis on the language barrier. Just as the above account ties the ability to comfort (the native phrase translates to "Never fear, madam, never fear") to the ability to communicate, the missionaries would have to learn the native language before they could preach the Gospel's message of saving grace. In July of 1813, when they arrived in Rangoon, Burma, the site where the mission was established, the first thing the Judsons set about doing was to learn the language so they could translate the Bible, write religious tracts and minister to the natives in their own tongue. Adoniram apparently excelled in acquiring the formal grammatical structure of the difficult language; after three years he had written a religious tract in Burmese. Ann, who was more immersed in the daily lives of the native women, learned the conversational dialect more quickly than her husband and by 1817 had begun to read the Bible to a small group of women on the Sabbath (Goodrich, 354-8). Her relative ease in communication would serve her well later, when she would have to plead with Burmese authorities to spare her husband's life. By another strange occurrence—the first of a number of hardships faced alone—Adoniram went missing for over seven months when the boat he was traveling in was blown off-course. While he was gone, the Burmese government began to persecute foreign teachers and the mission house in Rangoon was targeted. As the only one present who could speak Burmese, Ann was called upon to act as a diplomat and convince government officials of the mission's peaceful aims. An outbreak of cholera also occurred during her husband's absence, and she saved everyone in the mission house from infection. Due to a conflict that was brewing between England and Burma, ships were leaving Rangoon and Ann was encouraged to go, but she turned back at the last minute in faith that her husband was still alive. Two weeks later he made it back to Rangoon, to the news "that the preservation of the mission had been due to the firmness and fearlessness of his wife" (Goodrich, 358). For their efforts, the Judsons were not able to baptize a native convert until June 27, 1819. In America, friends were working on their behalf, urging the Baptist Church (the couple had converted from Congregationalists to Baptists) to organize behind the missionary cause, succeeding in 1814 with the establishment of the General Missionary Convention of the Baptist Denomination in the United States of America for Foreign Missions—which later spawned the American Baptist Missionary Union and the Southern Baptist Convention. In 1822, Ann, suffering from extremely poor health, returned on her own to America in order to recover. She spent the winter in Baltimore championing her missionary cause, giving speeches and publishing her book, History of the Burman Mission . A year later, though not yet fully recovered in health, Ann said goodbye to her friends with a sense of finality, and anxiously returned to Burma. The Judsons found support from their associates back home; however, the Burmese government did not receive these religious intruders as favorably, and public proclamation of the Gospel was restricted. When war broke out in 1824 between the Burmese Empire and the English government in India, this tenuous toleration of the foreigners turned into all out persecution. On June 8, 1824, Adoniram and several other missionaries were taken prisoner by Burmese officials on suspicion of being spies for the English. They were chained in heavy iron shackles in the notorious "death-prison," and would be held captive in deplorable conditions for nearly two years. Ann relentlessly sought any means she could of protesting their imprisonment, and pleaded with local authorities—and more directly addressed the sympathies of their wives—to spare the missionaries. She used the power of monetary persuasion instead of a religious appeal, repeatedly bribing jailers and using gifts to garner favors with the Governor to stay their execution. When officials came to the mission house to confiscate the group's private property, Ann cleverly hid several valuables which she later used as currency to obtain access to the prisoners. Biographies emphasize her ability to rouse pathos through oratory; she used her skill in the native language to disassociate her cause from British military action. To this end, she also adopted the local dress. Much of her heroic success came from being able to diplomatically navigate—though an outsider and a woman—through the patriarchal politics in Burma. On January 26, 1825, Ann gave birth to a baby girl, Maria (a son had been born September 11, 1815, but died eight months later) with no familiar companion present to care for her during labor. When the captives were suddenly forced to march to another prison, Ann, still weak from childbirth, begged the villagers to tell her where they had been taken. With her infant in her arms, she desperately followed her husband, who was near death after walking to the jail in Oung-pen-la. She pleaded for permission to nurse him back to health, and though starving herself, she procured food for Adoniram and the other prisoners. In her weakened condition, Ann fell severely ill during an epidemic of spotted fever and could no longer nurse Maria. Her husband obtained leave to carry their feeble baby through the village, begging nursing mothers to feed his child—a story which appears frequently in biographies as a scene sure to capture the sympathies of readers. She was buried in Amherst under a hopia (hope-tree), an emblem that often appears in the background of portraits that were engraved after her death. In April of 1827, two-year-old Maria was laid to rest by her mother's side. The first American woman to dedicate herself to the work of saving "heathens" in the "Orient," Ann Judson was also remembered as a heroine for saving the imprisoned missionaries, a heroic scene from many political conflicts in Europe and America. Goodrich writes: "She seems to have been providentially designed as the ministering angel of the Birman prison" (367, emphasis added). She is praised for her devoted ministry both to the Burmese natives and to her husband while he was held captive. Both she and her husband advocated their cause through writings for religious publications and through lectures on return visits. These representations made them famous and served as a kind of mission back home that arguably had more effect than any efforts abroad. The example she set, imagined as bearing the civilizing torch of Christian grace into dark, foreign spaces, was held up in collective biographies as a model of ministry for other women to follow. The success of this enterprise in biographical patterning is immediately apparent in relation to Ann Judson: after her death, two more women, Sarah Boardman Judson and in turn Emily Chubbuck Judson would directly emulate her missionary footsteps as wives of Adoniram Judson. Bolton, Sarah Knowles. Famous Types of Womanhood. New York: T. Y. Crowell, 1886; 1892. Child, Lydia Maria Francis. Biographies of Good Wives. New York and Boston: Francis, 1846. Clement, Jesse, ed. Noble Deeds of American Women: With Biographical Sketches of Some of the More Prominent. Buffalo: Derby, 1851. Goodrich, Frank Boott. World-Famous Women: Types of Female Heroism, Beauty, and Influence, from the Earliest Ages to the Present Time. Philadelphia: Ziegler, 1880. Hervey, George Winfred. The Story of Baptist Missions in Foreign Lands: From the Time of Carey to the Present Date. St. Louis: Chancy R. Barnes, 1884. Knowles, James Davis. Memoir of Ann H. Judson: Late Missionary to Burmah; Including a History of the American Baptist Mission in the Burman Empire. Boston: Gould, Kendall, and Lincoln, 1844 (1829). Williams, S. W. Queenly Women, Crowned and Uncrowned. Toledo, OH: Hood, [1880s?]. Wyeth, Walter Newton. Ann H. Judson: A Memorial. Cincinnati, OH: Published by the author, 1888. A synthesis of the biographical treatment of Ann Hasseltine Judson, based on several contemporary sources. Christian Biography: Lives of William Cowper, Mrs. Ann H. Judson, Anna Jane Linnard, Matthew Henry. Vol. VI. London: Religious Tract Society, 1799. From the Religious Tract Society's Christian Biography series, this volume devotes a section to Ann H. Judson, providing a biography based upon her journal entries and letters. Full-text edition of the volume linked through Google Books. Dana L. Robert, "Judson, Ann ('Nancy') (Hasseltine)." Biographical Dictionary of Christian Missions. Ed. Gerald H. Anderson. New York: Macmillan Reference USA, 1998. 346. Dana L. Robert's brief entry on Ann H. Judson from the Biographical Dictionary of Christian Missions webpage also provides a bibliography as well as links to other biographical sources about Ann H. Judson. Linked through the Boston University, School of Theology's History of Missiology website. Ethel Daniels Hubbard, Ann of Ava. New York: Missionary Education Movement of the United States and Canada, 1913. Ethel D. Bubbard's biography for young people about Ann H. Judson is distingished by its readable, narrative tone. Excerpts from Ann's journal are dispersed throughout the text. This edition also contains several illustrations. Full-text link accessed through Google Books. George Winfred Hervey, The Story of Baptist Missions in Foreign Lands: From the Time of Carey to the Present Date. St. Louis: Chancy R. Barnes, 1884. Outlining the history of British and American Baptist Missions, George W. Hervey's text contains a chapter on Ann H. Judson which focuses specifically on the "excellences" of her character. Full-text edition linked through Google Books. James Davis Knowles, Life of Mrs. Ann H. Judson: Late Missionary to Burmah. Philadelphia: American Sunday School Union, 1830. James D. Knowles wrote this condensed version of his Memoir of Ann H. Judson at the request of the American Sunday School Union. This text also includes several detailed illustrations of Burmah that are not in the Memoir. Full-text edition provides the author's preface. Linked through Google Books. James Davis Knowles, Memoir of Ann H. Judson: Late Missionary to Burmah; Including a History of the American Baptist Mission in the Burman Empire. Boston: Gould, Kendall, and Lincoln, 1844 (1829). Pastor James D. Knowles' detailed biography about Ann H. Judson, which includes extracts from her journal and letters. Written at the request of the Baptist Board of Missions, the Memoir of Ann H. Judson was published in several editions. This edition provides "a continuation of the history of the mission to the present year," as well as the author's preface from the first edition. Full-text link through Google Books. Walter Newton Wyeth, Ann H. Judson: A Memorial. Cincinnati, OH: Published by the author, 1888. Walter N. Wyeth's biography memorializing the life and missionary work of Ann H. Judson. Wyeth's preface is included, in which he discusses the importance of producing such biographies as will encourage young people to commit themselves to Christian missionary work. Full-text edition linked through Google Books.